Mold making from China is normally 30-50 percent cheaper than Europe and United States, some people said that is just because Chinese mold is low quality. I can't agree it at all. There are plenty of oversea companies doing business in China and importing injection molds from China, and there would be more. Why is that? If Chinese mold is just simply low quality, I think the smart business owners will learn their lessons and stop to buy molds from China. Today l am trying to give a comprehensive view of it. In China mainland, the labor right protection have been ignored in a long time, the working condition, warfare, basic wage are much more poor than developing countries, this is pain for normal people, but it becomes to be an advantage for Chinese products, in the past few years, situation have been improved a little, but it still has a long way to go, for instance, a qualified mold maker in China only cost 5000RMB/month, only 800 USD per month, it's 4-5 times in Germany. After 30 years reform and opening up, there are more and more Chinese injection mold making technicians, some of them even have an international view and background, they are familiar with how a customer from Europe or north America works, you don't have to understand Chinese or bring a translator to visit a Chinese mold factory, most of the factory have the ability to communicate with you and manage your projects in fluent English and a comfortable way. Comparing with new Emerging countries such as Vietnam, Thailand etc. intelligence is not an advantage they can overcome in a short time. 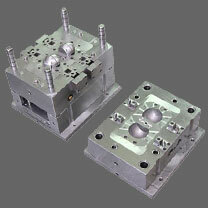 During past few years, there are more and more international mold companies enter into China mainland, they are now not satisfied to just buy molds from China, instead of which, they invest into China and build their mold making factories in China, mature manufacturing chains and intelligences, cheap resources make higher interests possible, Besides, China now have become a most attractive consume market.